As The Man Phoning Mum makes clear, the cinema that appears in The Girl Chewing Gum is no longer there. After forty years in operation, the Dalston Odeon closed down on 31 March 1979. The building remained empty until 1984, when it was demolished to make way for the block of flats that currently occupies the site. One might find nothing particularly remarkable about the Odeon’s demise; after all, the same fate has befallen dozens of former London cinemas. However, there is a certain curiosity to the way in which its destiny both diverges from and points to the life The Girl Chewing Gum has led in the age of video. On the one hand, the Odeon and Smith’s film are nothing alike: the cinema is gone and forgotten, while the film has in recent years reached new heights of popularity and acclaim. But on the other hand, the disappearance of the Odeon indexes a notable feature of the contemporary existence of The Girl Chewing Gum: today, it is often found far from the movie theatre in the spaces of contemporary art, where it has entered new frameworks of distribution and exhibition. In 1984, the same year the Odeon was razed, Smith made an initial foray into gallery exhibition when Shepherd’s Delight 1980–4 was selected for that year’s British Art Show, which toured to museums in Birmingham, Edinburgh, Sheffield and Southampton and was the first to include the moving image (fig.1). The thirty-five-minute long 16 mm film had been made for theatrical presentation and relies heavily on the start-to-finish trajectory and spectatorial attentiveness such a situation enables. As such, it did not fare very well when transferred to video, looped and shown on a small monitor with no seating provided. In the 1990s, however, the circumstances under which the moving image might be exhibited in art spaces began to change dramatically, principally due to the availability of data projectors and video formats of increasing quality. The decade witnessed an explosion of moving images in galleries and museums, one that occurred very much under the sign of cinema. Film historical references, engagements with illusionistic narrative, new documentary practices and a pictorialism never before seen in video predominated – all of which contributed to a situation in which ‘video art’ largely shed its ties to television and gave way to what would increasingly be called ‘artists’ cinema’ or ‘artists’ moving image’.1 Such a climate fostered new interest in the history of avant-garde film, introducing canonical works like The Girl Chewing Gum to different audiences. Historically situated at arm’s length from the art world, avant-garde film now appeared as a vast and rich archive that might be integrated into the gallery alongside newly emerging practices. On the occasion of the RCA exhibition, the critic Martin Herbert wrote that ‘John Smith’s films and videos have been criminally under-shown in his home city’.3 Certainly the increased attention from the art world has helped to remedy this, with the RCA’s Solo Show in particular bringing together twenty-two of Smith’s works. 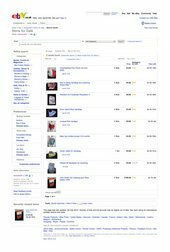 How might one account for this flurry of interest? One might see it simply as The Girl Chewing Gum belatedly getting the respect it has always deserved. But it is worth noting that the film also fulfils a desire that shaped much curatorial activity in the early twenty-first century. When the art critic and historian Hal Foster wrote of the ‘archival impulse’ in contemporary art, he was describing artistic practices that delved into and reactivated forgotten histories.4 But a related form of archive fever also struck curators during this period, as it became common for exhibitions devoted to contemporary art to include older works. Many curators rummaged through marginalised histories in search of major figures who might be presented to the mainstream art context as new discoveries. Although Smith counts as a firmly canonised figure in the history of avant-garde cinema, until recently he had been relatively absent on the gallery circuit – much like Anthony McCall, Paul Sharits and Morgan Fisher, figures of the same generation who received similar treatment during this period. What is potentially undermined when it is exhibited in the gallery is the film’s investment in a start-to-finish structure. Viewers can walk in and out of the space at any point in the loop, resulting in the strong likelihood that they will miss its passage from direction to fabulation or find out too soon that the narrator is positioned some fifteen miles away on Letchmore Heath. Smith has tried to mitigate this possibility by looping the film to commence every fifteen minutes, thus encouraging the viewer to encounter it from beginning to end. Morgan Fisher, a figure who has worked in both the cinema and in art contexts, has made a distinction between what he calls ‘teleological film’, which relies on a particular linear progression to create meaning, and works that may be encountered at any point and are thus amenable to display on loop.8 Fisher’s distinction does not rely on authorial intentionality – on whether or not the filmmaker originally intended the work to be shown in a gallery, cinema, or both – but rather on how the internal textual organisation of the work interacts with its screening context. There is no doubt that The Girl Chewing Gum is a teleological film in Fisher’s understanding of the term and thus would better be seen under conditions that would facilitate start-to-finish viewing. However, agreeing to exhibit it in the gallery means that it will be seen by a significantly larger number of people, thus perhaps making the migration into the art context worth the sacrifice. The Girl Chewing Gum continues to have a life not only within the broader context of contemporary art, but also within Smith’s own practice. In 2011 he engaged in a multi-part revisiting of the film that took the form of an installation called unusual Red cardigan, on view at PEER Gallery in Hoxton, east London, from 5 October to 10 December. The exhibition interrogated the space between the ‘then’ of filming The Girl Chewing Gum and the ever-shifting ‘now’ of its reception over time. It proposed that the temporal frame of the film must not be understood as limited to those moments in 1976 when it was first made or first shown, but must be expanded to encompass its subsequent circulation and reception. In line with the autobiographical thrust of much of Smith’s recent work, the exhibition explored the place that The Girl Chewing Gum has occupied in the life of its maker over the course of the thirty-five years since its production. The people who happened to pass through my camera’s field of view one grey afternoon in Dalston 35 years ago have become very familiar to me now and feel like old friends. The Girl Chewing Gum herself must be at least 50 years old, probably a grandmother. I wonder what clothes she wears now, whether she still chews gum and whether she, like myself, still lives nearby. Maybe we pass each other in the street. The girl and serenporfor converged for Smith as two anonymous figures known only by their aliases. Incidental yet essential, they remain enigmas beyond their appearances in Smith’s work, perhaps unaware of the roles they play. They became the twin protagonists of unusual Red cardigan, serving to enlarge the temporal frame of The Girl Chewing Gum to include both the unknown futures of all who appear within it and the many unknown viewers who have encountered it over the years in its various release formats. The second and third components of the exhibition furthered this interest by making recourse to one of the great preoccupations of recent artists’ moving image: the remake. The remake is a form marked by an internal schism in that it both invokes the original and asserts a distance from it. It invariably gestures to the past, creating a temporal space that extends from the present moment of remaking back to the original’s date of production, encompassing all that lies between. Next to the frame enlargement of the girl chewing gum in the show was a cluster of nine monitors showing numerous homages to The Girl Chewing Gum that have appeared online (fig.7). Each had headphones attached, but it was not immediately clear which set of headphones matched with which monitor, thus compromising the autonomy of any particular video and creating a set of relations between the multiple screens. With titles like The Guy in the Fluorescent Jacket, these remakes replay the conceit of Smith’s film for a number of different purposes: a university assignment to copy an artist’s work, a test of a 7D digital camera, or just for fun. Some are relatively straightforward, while others attempt a more clever play on the original, such as Emma Barltrop’s Chewing the Girl’s Gum 2011, in which the artist projects Smith’s film on a wall and writes over the image with a crayon in an effort to name everything that appears onscreen. Lurking amid these homages was a copy of the original film found online, albeit one that was both subtitled and rather poor quality, as it had been rephotographed off a television screen when it was broadcast in France. Like the story of serenporfor’s VHS tape, this section of the exhibition engaged with the distribution of The Girl Chewing Gum by means of secondary formats primarily intended for home viewing. If the new presence within the art space has been the most conspicuous of the film’s contemporary travels, Smith’s assembly of remakes points to another facet of its circulation, one that did not exist at the time of its production but which has played a significant role in the reception history of The Girl Chewing Gum: the networks of digital dissemination. The final element in this constellation was Smith’s own remake, The Man Phoning Mum. Smith is far from the only avant-garde filmmaker of his generation to return to his best known film to produce a digital remake: in 2003 Michael Snow remade Wavelength 1967 as WVLNT (Wavelength For Those Who Don’t Have the Time), while in 2010 Anthony McCall remade Line Describing A Cone 1973 as Line Describing A Cone 2.0. But in these latter two cases, the concern lies primarily in the medium-specific differences between film and video (although questions of temporality and attention are also important for Snow). Quite differently, in The Man Phoning Mum – as in the rest of unusual Red cardigan – what is at stake is not only the analogue/digital divide but also autobiography and historicity. The Man Phoning Mum telescopes the Dalston of 1976 and the very different Dalston of 2011, recasting the original as an historical document.15 If the group of remakes found online and shown in the installation points to the place of The Girl Chewing Gum in film history, The Man Phoning Mum builds upon this to examine the 1976 film as history tout court. 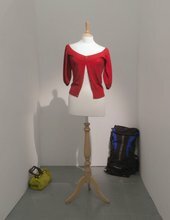 The unusual Red cardigan installation charts the migration of The Girl Chewing Gum across media (16 mm film, VHS, television, digital video), across spaces (cinema, gallery, the internet) and also – crucially – across the bulk of Smith’s life, from age twenty-three to age fifty-nine. Art historian David Joselit has recently emphasised the ‘need to write histories of image circulation’.16 The exhibition might be understood as taking up this call, as Smith returns to his own film to trace out the multiple and sometimes unlikely pathways it has taken since its creation. He understands The Girl Chewing Gum not just as an immaterial representation that exists on a plane separate from reality, to be considered only within the restricted framework of the aesthetic, but also as a thing with a life in the world. This thing is part not only of the histories of art and cinema, but material and personal histories as well. unusual Red cardigan is a strange kind of retrospective in that it contains none of the artist’s earlier works (at least not in their original form) and yet functions as an idiosyncratic reflection on a life, a career, and on the film that marked both most deeply. Almost forty years after its making, The Girl Chewing Gum continues to resonate for its maker and its variegated audiences in new and unforeseen ways, proving that avant-garde film can be funny, critical, autobiographical, and historical – all at once. 1. As curator Chrissie Iles wrote in 2003, ‘In form and content, video is now mimicking the qualities that had always pertained exclusively to film. The use of the word video as a defining term for a particular area of contemporary art no longer appears to be either necessary or relevant’. Chrissie Iles, ‘Issues in the New Cinematic Aesthetic in Video’, in Tanya Leighton and Pavel Büchler (eds. ), Saving the Image: Art after Film, Glasgow and Manchester 2003, p.140. 2. Jens Hoffmann, ‘6th Berlin Bienniale’, Frieze, no.133, September 2010, http://www.frieze.com/issue/review/6th-berlin-biennale, accessed 15 June 2015; Alexander Scrimgeour, ‘6th Berlin Biennale’, Artforum, September 2010, http://artforum.com/inprint/issue=201007&id=26169, accessed 15 June 2015. 3. Martin Herbert, ‘John Smith’, Frieze, no.132, July/August 2010, http://www.frieze.com/issue/review/john_smith, accessed 15 June 2015. 4. Hal Foster, ‘An Archival Impulse’, October, no.110, Autumn 2004, pp.3–22. 5. For an extensive discussion of the film’s relationship to structural/materialism, see Erika Balsom, ‘A “New Face” at the Co-op’, September 2015, in Erika Balsom (ed. ), In Focus: ‘The Girl Chewing Gum’ 1976, by John Smith, September 2015. 6. Notably, this has resulted in both of these films being exhibited far less frequently than those Smith has agreed to transfer to video. 7. Smith adds, ‘Because you have to go to another country now to get film prints made, it feels a bit decadent. The puritan part of me feels like it’s decadent to be destroying a film print willfully by showing it continuously in a room with no one in it. These machines are going round, scratching up a thing that took so much money and effort to produce’. John Smith, interview with the author, 16 June 2014. 8. Morgan Fisher, ‘Experimental Film in a Museum Context: Material’, panel discussion held on 4 May 2010 at the Los Angeles County Museum of Art, Los Angeles. 9. Smith’s work has also been distributed by Light Cone (Paris), Video Data Bank (Chicago) and Canyon Cinema (San Francisco). 10. In 2006 The Girl Chewing Gum was included on the compilation DVD Cinema 16: British Short Films. In 2011 LUX released a three-DVD box set of Smith’s work. 11. The negative and the master sound material are now housed at the BFI National Archive, but Tate acquired an interpositive and two internegatives, as well as an optical sound negative. 12. There is also a thirteen-minute video version of unusual Red cardigan, which was not shown at PEER. 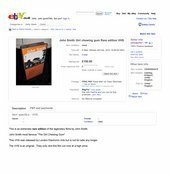 In the video, shot in Smith’s home, the artist recounts his experience with the online auction and unwraps his purchases, showing each object to the camera. 13. This text is reproduced in Tanya Leighton and Kathrin Meyer (eds. ), John Smith, Milan and Berlin 2013, p.163. 15. For a discussion of these differences as shown in The Man Phoning Mum, see Erika Balsom, Patrick Wright and John Smith, ‘Dalston, Then and Now: An Interview with John Smith’, September 2015, in Balsom (ed.) 2015. 16. David Joselit, After Art, Princeton 2013, p.112, emphasis in text. Erika Balsom, ‘A Film in the Age of Video’, in Erika Balsom (ed. 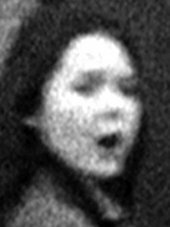 ), In Focus: The Girl Chewing Gum 1976 by John Smith, Tate Research Publication, 2015, https://www.tate.org.uk/research/publications/in-focus/the-girl-chewing-gum-john-smith/a-film-in-the-age-of-video, accessed 24 April 2019.